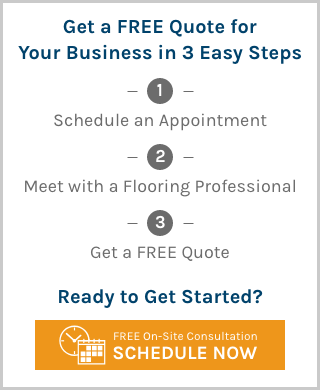 Get commercial-grade flooring that helps resist cracking, splitting, or peeling due to high volume traffic. Vinyl Composite Tile (VCT) combines an expansive color palette with durability to bring the right design choice. Vinyl Composite Tile (VCT) stands up to the both the design and practical expectations of commercial spaces. This very hard tile is designed to look great and perform exceptionally well, even under the highest traffic conditions. If there happens to be a small scrape or scuff, it will generally be less noticeable because the color runs throughout the tile, from top to bottom. Plus, it contains recycled content, making it a great choice for green building and LEED projects. *CARPET & FLOORING: Next Day Installation on in-stock styles only. In select areas, Next Day Installation may not be available every day. Floor preparation may add to installation time. WINDOW TREATMENTS: Next Day Installation on select products and styles for orders received by 10 a.m. CST. In select areas, Next Day Installation may not be available every day. Additional charges may be incurred for work performed after normal business hours. **Subject to manufacturer’s conditions. Not available in all areas. Additional charges may apply. If You Are Using A Screen Reader And Are Having Problems Using This Website, Please Call (888) 588-2395 For Assistance.